The Banner Saga had a quietly successful 2014. The game won the New Game Network GOTY awards for Best Graphics (Art), Best PC Exclusive, Best Strategy Game, and was a Honorable Mention for Game of the Year. It made numerous top ten lists on other sites and was the winner or nominee for other awards, yet it still doesn’t seem to get the attention of other popular indie titles. It will be interesting to see if Stoic Studios can change this with the upcoming Banner Saga 2. As the game has been in development for about a year and a half, it’s impressive to see how far along Stoic Studio already is in the process. It helps that the title does little to change its aesthetic, but I was able to play for about an hour starting from beginning as any normal player would. This wasn’t a vertical slice of the game but the first chapter of the story. The Banner Saga 2 will remember your choices from the original, most importantly, which characters you saved and which died. This dynamically changes who you play as and who you have available in the party. Since I didn’t have a save on-hand to load, I could choose between the default saves for either the grizzly ranger Rook or his spirited daughter, Allette. I picked Rook as he was the character I saved in the first game. Though, I was curious to see how the story would progress through his daughter’s eyes. In Rook’s campaign he is dealing with the death of his daughter, but not very well. The game picks up immediately after the defeat of the Bellower as you and your clansmen journey south down the river, finding other villages still battling the dredge. This river travel exchanges your long trail of weary travelers for a group of boats, though your vibrant red banner remains at the front of the convoy, flapping in the wind. Rook and company stop at a village that's under attack from the dredge. The armor clad monsters of the first game have continued their march south, despite the loss of their thought-to-be-indestructible leader. After Rook and his fighters have safeguarded the village, you are faced with your first choice as a leader: evacuate the people or leave them to their death as the dredge continue southward. 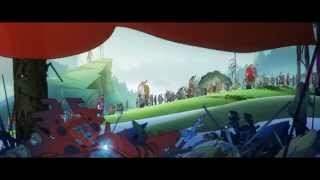 While the look of The Banner Saga remains the same, there have been some changes to the gameplay. Renown now can be affected by some of the choices you can make, being taken away when you ask for help or added when you heroically lead the charge yourself. You can also convert your clansmen into fighters in Banner Saga 2, but they will consume more resources. Conversely, the more clansmen you have, the more they will spread word of your great deeds and increase your renown, which you can use to buy supplies and special equipment. The conversation mechanics of the game are familiar. There is no voice-over during dialogue and the camera usually flips between two static characters with small bits of animation. Also similar to the first game is the phenomenal writing. Rook’s dark and somber mood leaves you with many options which remain in character, but still feel different. My choices caused Rook’s friend Iver to scold me about my indifferent silence. While in this initial village I came across a mercenary group called The Ravens. The leader of this group is the broken horned Varl from the announcement trailer; he is also joined by a spear wielding woman. The pair agree to travel with us. While much of The Banner Saga feels familiar, there is an upgrade in the cinematic quality of the game. There are more cutscenes and more narration than in the previous game. The animations are more fluid and beautifully impressive. It’s clear that The Banner Saga 2 has a more significant budget than its predecessor. As I continue down the river, my party comes to a waterfall and are forced to pull our boats to the shore where an army of dredge are waiting. I start a new battle and select my party, their turn order, and equip any special pieces of armor I have. Then I hit the battlefield. Again, this aspect of The Banner Saga 2 is very similar to what one would expect having played the first game. The turn-based, "attack armor or health" mechanics are still alive and well; little has changed in this department. The same is true of the difficulty. It’s not that The Banner Saga or its sequel are overwhelmingly unfair, but they are unforgiving in their design. Moving your characters around the battlefield, selecting which warriors to keep at a distance and which to attack with is as important as ever. It’s the same sleek and well-crafted tactical choices I appreciated in the first game. Also, much like the first game there isn’t always a second chance. After losing the fight, I didn’t get a fail state and start the battle anew. Instead, I had to forge ahead and make a new decision, incurred by my defeat. Here the demo came to a conclusion with a cliffhanger, as my people attempted to flee the dredge after I had failed to break their ranks. 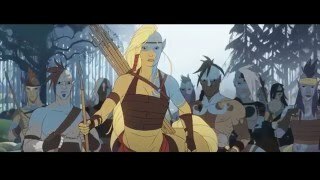 For those who enjoyed The Banner Saga, its sequel looks like it is going to be more of the same. More of the decisions that leave you between a rock and a hard place, more of the brainy tactile combat, and more of the weighty narrative that beats its characters down time and time again. Simply hearing Austin Wintory’s emotional score and seeing the gorgeous hand-drawn aesthetic was powerful enough to move me. As a fan of the original game, it’s safe to say that I am very excited about what The Banner Saga 2 has to offer fans of the series. The Banner Saga 2 will launch in 2016 on PC and Mac. The original game was also recently released on the Apple Store and is debuting soon on PlayStation consoles.